Acute or chronic inflammation of the Infrapatellar fat pad (IFP) is a common source of anterior knee pain; also called Hoffa's disease, fat pad syndrome or hoffitis. Fat pad syndrome was firstly reported by Albert Hoffa in 1904 . The IFP is found in the anterior knee compartment as a mass of adipose tissue that lies intracapsular but extra synovial (extra-articular). Superiorly by the inferior pole of the patella and alar folds. Posteriorly by the femoral condyles, intercondylar notch and the synovial membrane. Innervated mainly by the posterior tibial nerve, the IFP can be a source of both localized and severe knee pain. This could be attributed to the presence of type VIa nerve endings which could be activated through mechanical deformation or chemical pain mediators. Substance P-nerve fibers are also present in individuals with anterior knee pain, particularly when the infrapatellar fat pad is inflamed. As a potential source of inflammation and pain, some authors considered the fat pad to be a key structure in patellar tendinopathy and osteoarthritis. The IFP is a dynamic structure. It alters position, pressure, and volume throughout the knee ROM. When the knee moves into flexion, the superolateral portion of the fat pad becomes relaxed, freely expansive and moves posteriorly. In extension, the IFP lies between the lateral patella facet and quadriceps tendon. Therefore, most commonly observed symptoms are associated with extension. 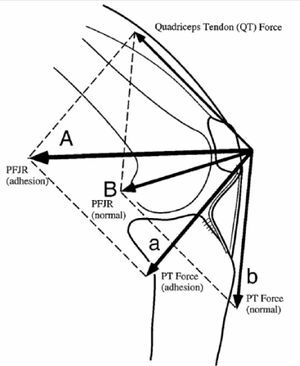 However, it could also be seen in in flexion, where pain is provoked by the trapped IFP between the patella tendon and anterior femur. IFP facilitates gliding between the femoral condyles and joint capsule. Knee mechanics can be altered when there is adhesion in the fat pad that changes the position of the patella and patellar tendon. Consequently, the effectiveness of the extensor mechanism is compromised, decreasing the effective moment arm placing greater demands on the quadriceps to produce the same knee extension force. A shorter patellar tendon length affects patellar mobility and creates resistance to lateral translation at full extension. A study showed reduced coordination between medial and lateral vastus muscle motor units in anterior knee pain. Another reported a significantly later activation and reduced amplitude of contraction of quadriceps during stair stepping following injecting the fat pad with a painful hypertonic saline. The inhibited fat pad resulted in increased patellofemoral loading and reduced quadriceps activation. However, the exact association of fat pad and knee biomechanics needs further investigation. Early studies reported the fat pad to be a lubricant structure that facilitated the flow of synovial fluid inside the joint. Subsequently it has become clear that the IFP yields more sophisticated functions due to its complex neurovascularity. The IFP is considered to be a producer of many inflammatory mediating substances found in association with OA. As an adipose tissue, IFP mainly secretes fatty acids which are well-known for their pro-inflammatory effects. Adipose tissue also stores immune cells, another potential source of inflammatory mediator substances. In addition, a study showed that IFP actively secretes IL-6 and its soluble receptor sIL-6R, at relatively higher levels compared to other adipose tissues. IFP has been found to release mesenchymal stem cells with enhanced chondrogenic activity but this finding requires further investigations . Regulation of glycosaminoglycan release, a source of reparative cells, release of pro-inflammatory cytokines associated with elevated BMI and collagen release are also reported to be functions of IFP. Duran et al  studied the IFP volume and found it to be decreased in patellar cartilage defect. Little is known about the development of fat pad syndrome. The anatomical location of IFP exposes it to mechanical load, especially during extension. Overuse or repeated micro trauma from sports or falls lead to hypertrophy. If the fat pad fails to recover it can become chronically inflamed which, if not properly managed, may result in fibrosis and ossification. Predominantly seen in young women, jumping sports and ligamentous laxity are also considered to be risk factors for Hoffa's disease. The inflamed fat pad is often enlarged, firm in consistency and easy to palpate. Hoffa’s test can be performed. To avoid pain provocation in adjacent structures and incur false results, Krumar et al  suggested a modification of hoffa’s test. This involves taking the knee into passive forced hyperextension by lifting the heel and keeping anterior pressure on the tibia. This position stimulates pain exclusively in the fat pad, if it is inflamed. Gliding the patella in all four directions (medially, laterally, superiorly and inferiorly) is important to detect adhesion or movement restriction during knee movement, particularly in hyperextension. Pain in hyperextension is a strong indicator of the presence of inflamed IFP . Examination should also aim to exclude any other radiating pathologies particularly from spine and hip. Fat pad syndrome could be a primary disorder or secondary to other pathologies such as meniscus injuries and or ligamentous tear. Prevalence is not widely investigated, however, two studies reported isolated fat pad in 1%  of anterior knee pain cases and 6.8% as a secondary disorder. Synovitis and swelling of the fat pad were reported after anterior cruciate ligament (ACL) rupture. A detailed history and findings on functional assessment are important to discriminate fat pad syndrome from other conditions such as : patellar lateral femoral friction syndrome, impingement of the infrapatellar plica and arthrofibrosisor “cyclops syndrome”. Refer to the discussion in this article to learn about the characteristics of each condition. Symptoms of fat pad syndrome are anterior knee pain, often retropatellar and infrapatellar. Patellofemoral crepitus might be present, with knee loading such as in stairs negotiation, squatting, jumping and running. Effusion and decreased ROM are often seen with inflamed IFP. Pain and/or discomfort from long walks, flat shoes and prolonged standing refer mostly to fat pad syndrome. Pain resulting from up or down hill walking is a characteristic of PFPS. MRI is the best imaging technique in diagnosing IFP inflammation. Edema of the superior/posterior fat pad, inflamed infrapatellar bursa are easily detected by magnetic resonance. However, it is recommended to refer the patient to MRI only to exclude any other pathologies , particularly when there is a history of trauma . Dynamic sonographic assessment revealed superolateral fat pad impingement associated with association with a perceived tight Iliotibial band. Patients are often prescribed conservative treatment and physiotherapy. If the symptoms persisted. other approaches are introduced. Diagnostic and therapeutic injections of local anesthetics and steroid into the fat pad resulted in immediate pain relief and reconstruction of movement. Arthroscopic resection In two studies resulted in improvements on both Cincinnati rating System and Lysholm knee score. Refer to the case reports in this article to learn about different management approaches. This usually occur as a result of falls, direct knee trauma or after knee surgeries resulting from arthroscopic equipment. Ice massage is very useful to relief acute symptoms. It could be followed by taping to alleviate pressure off the fat pad. Flat foot wear should be avoided to minimize IFP loading. Advice patient to avoid provocative activities till the acute symptoms resolve. Usually there is no history of trauma. Biomechanical abnormalities, such as excessive hyperextension, should be addressed to decrease IFP loading. Quadriceps and anterior hip stretching is found to improve IFP restriction symptoms. There is a significant impact of high BMI and obesity on knee OA and fat pad syndrome. An 18-month RCT investigated the effect of a weight loss program (Exercise and/or diet) on the IFP. The study reported significant reduction in the IFP volume as a result of weigh loss and changes in body fat percentage, mostly achieved by combining exercise and diet. ↑ 1.0 1.1 1.2 1.3 1.4 1.5 1.6 1.7 1.8 1.9 Larbi A, Cyteval C, Hamoui M, Dallaudiere B, Zarqane H, Viala P. et al. Hoffa's disease: A report on 5 cases. Diagnostic and interventional imaging. 2014;95(11):1079-84. ↑ 2.00 2.01 2.02 2.03 2.04 2.05 2.06 2.07 2.08 2.09 2.10 2.11 Mace J, Bhatti W, Anand S. Infrapatellar fat pad syndrome: a review of anatomy, function, treatment and dynamics. Acta Orthopaedica Belgica. 2016;82(1):94-101. ↑ Bohnsack M, Wilharm A, Hurschler C, Rühmann O, Stukenborg-Colsman C, Wirth CJ. Biomechanical and kinematic influences of a total infrapatellar fat pad resection on the knee. The American journal of sports medicine. 2004;32(8):1873-80. ↑ Bohnsack M, Meier F, Walter GF, Hurschler C, Schmolke S, Wirth CJ. et al. Distribution of substance-P nerves inside the infrapatellar fat pad and the adjacent synovial tissue: a neurohistological approach to anterior knee pain syndrome. Archives of orthopaedic and trauma surgery. 2005;125(9):592-7. ↑ Culvenor AG, Cook JL, Warden SJ, Crossley KM. Infrapatellar fat pad size, but not patellar alignment, is associated with patellar tendinopathy. Scandinavian journal of medicine & science in sports. 2011;21(6):e405-11. ↑ Clockaerts S, Bastiaansen-Jenniskens YM, Runhaar J, Van Osch GJ, Van Offel JF, Verhaar JA. et al. The infrapatellar fat pad should be considered as an active osteoarthritic joint tissue: a narrative review. Osteoarthritis and Cartilage. 2010;18(7):876-82. ↑ 7.0 7.1 7.2 7.3 7.4 Hannon J, Bardenett S, Singleton S, Garrison JC. Evaluation, Treatment, and Rehabilitation Implications of the Infrapatellar Fat Pad. Sports health. 2016;8(2):167-71. ↑ Mellor R, Hodges PW. Motor unit syncronization is reduced in anterior knee pain. The Journal of pain. 2005;6(8):550-8. ↑ Hodges PW, Mellor R, Crossley K, Bennell K. Pain induced by injection of hypertonic saline into the infrapatellar fat pad and effect on coordination of the quadriceps muscles. Arthritis Care & Research. 2009;61(1):70-7. ↑ 10.0 10.1 10.2 Ioan-Facsinay A, Kloppenburg M. An emerging player in knee osteoarthritis: the infrapatellar fat pad. Arthritis research & therapy. 2013;15(6):225. ↑ Distel E, Cadoudal T, Durant S, Poignard A, Chevalier X, Benelli C. The infrapatellar fat pad in knee osteoarthritis: An important source of interleukin‐6 and its soluble receptor. Arthritis & Rheumatism: Official Journal of the American College of Rheumatology. 2009;60(11):3374-7. ↑ Caspar-Bauguil S, Cousin B, Galinier A, Segafredo C, Nibbelink M, Andre M et al. Adipose tissues as an ancestral immune organ: site‐specific change in obesity. FEBS letters. 2005;579(17):3487-92. ↑ Dragoo JL, Samimi B, Zhu M, Hame SL, Thomas BJ, Lieberman JR, et al. Tissue-engineered cartilage and bone using stem cells from human infrapatellar fat pads. The Journal of bone and joint surgery. British volume. 2003;85(5):740-7. ↑ Kim CS, Lee SC, Kim YM, Kim BS, Choi HS, Kawada T. et al. Visceral fat accumulation induced by a high‐fat diet causes the atrophy of mesenteric lymph nodes in obese mice. Obesity. 2008;16(6):1261-9. ↑ Duran S, Akşahin E, Kocadal O, Aktekin CN, Hapa O, Genctürk ZB. Effects of body mass index, infrapatellar fat pad volume and age on patellar cartilage defect. Orthopaedic journal of sports medicine. 2014;2(11_suppl3):2325967114S00159. ↑ 16.0 16.1 16.2 Kumar D, Alvand A, Beacon JP. Impingement of infrapatellar fat pad (Hoffa’s disease): results of high-portal arthroscopic resection. Arthroscopy: The Journal of Arthroscopic & Related Surgery. 2007;23(11):1180-6. ↑ 18.0 18.1 Ogilvie-Harris DJ, Giddens J. Hoffa's disease: arthroscopic resection of the infrapatellar fat pad. Arthroscopy: The Journal of Arthroscopic & Related Surgery. 1994 ;10(2):184-7. ↑ Witoński D, Wągrowska-Danielewicz M. Distribution of substance-P nerve fibers in the knee joint in patients with anterior knee pain syndrome A preliminary report. Knee Surgery, Sports Traumatology, Arthroscopy. 1999;7(3):177-83. ↑ House CV, Connell DA. Therapeutic ablation of the infrapatellar fat pad under ultrasound guidance: a pilot study. Clinical radiology. 2007;62(12):1198-201. ↑ Dragoo JL, Johnson C, McConnell J. Evaluation and treatment of disorders of the infrapatellar fat pad. Sports medicine. 2012;42(1):51-67. ↑ Murillo AL, Eckstein F, Wirth W, Beavers D, Loeser RF, Nicklas BJ. et al. Impact of diet and/or exercise intervention on infrapatellar fat pad morphology: secondary analysis from the intensive diet and exercise for arthritis (IDEA) trial. Cells Tissues Organs. 2017;203(4):258-66.